Decorating your Christmas tree doesn’t always have to be about snow, tinsel, and Santa Claus. If you’re in a creative rut, let Christmas Tree Market give you some inspiration. Add a bit of style and whimsy to your home with these easy-to-follow tips for decorating your tree this Christmas. Bring the joy of Christmas morning to your home every day by dressing your tree in white. Start by spreading out white baubles, snowflakes, and paper banners around your tree. Add white glittered berries and frosted pinecones to give shine and sparkle to the ensemble. To complete your winter white Christmas tree, wrap a white “Merry Christmas” banner around it, and top it off with a silver bow. Decorate your trees with vivid colors and have an aura of playfulness and excitement in your home —perfect for getting in the Christmas mood. 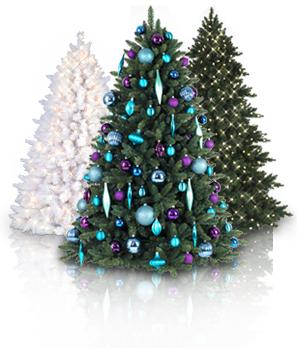 Start by choosing blue, aqua, green, and teal Christmas balls, which work well with green or white artificial Christmas trees. Choose decorations with a shiny finish to let the tree sparkle with, or without lights. Add not-so-traditional ornaments like toys and fun family memorabilia for a whimsical tree you can enjoy all Christmas season. If you’re looking for a project to do with your kids, creating DIY tree ornaments is a great way to spend the weekend. Write a message like “Merry Christmas” with white chalkboard pens on black cardboard paper. You can also create personalized messages, or have your kids write their names. Easily make paper snowflakes using craft paper, or snowman ornaments with glue and Styrofoam balls. There’s no better feeling than opening Christmas presents under a tree filled with decor made by you and your kids. Cottage inspired decor is well loved because it is comfortable and familiar. Bring the same sensibility to your tree by choosing creamy white, yellow, and grey ornaments. Incorporate woodsy elements like faux tree branches and acorn clusters. These cute owl ornaments from Etsy go well with the cabin in the woods decor. Cascading burlap ribbons give the tree a richer feel, and complete the warm and relaxing theme. If you’re a fan of decorating your tree early, there’s no need to redecorate when the winter breeze starts blowing. Transitional trees with red, green, and earthy decor remain relevant from autumn to spring. Brown pinecones and gold ribbons are traditionally for Christmas, yet go well with Thanksgiving decorations, too. For added accents, decorate your green Christmas tree with red Christmas baubles and winterberries. Get out of your holiday decorating rut with these simple, yet creative Christmas tree decorating ideas from Christmas Tree Market. Still haven’t found the right tree to decorate? Take a quick peek at our easy guide for choosing your Christmas tree here.